Daily Deals Blog | Will Daily Deal Vouchers Be Taxed Differently in the United States This Year? Will Daily Deal Vouchers Be Taxed Differently in the United States This Year? How much tax should you pay on a daily deal? Many states in the U.S. are pondering this question now and the answer could change how much you invest in daily deal shopping in the future. Let’s say you pay $50 for $100 in restaurant food courtesy of a daily deal. Local sales tax rates currently average 9.6% nationwide in the United States according to Vertex, Inc.,which means that imposing a tax on the value price of your voucher ($50) would add approximately $4.80 to your bill. This is how the state of California treats discount vouchers, and how most seem to think taxation should work. In New York and other states, however, daily deal vouchers are taxed at full face value. At those rates, bargain friendly shoppers are paying $9.60 in taxes for a $50 voucher--or a 19.2% sales tax. That's not such a good deal any longer, is it? By and large, most U.S. states have made no formal taxation rules regarding daily deal vouchers. Back in early 2011, Forbes Magazine ran a headline story questioning the perplexity surrounding daily deal purchases and tax laws. That confusion may finally be starting to clear up. 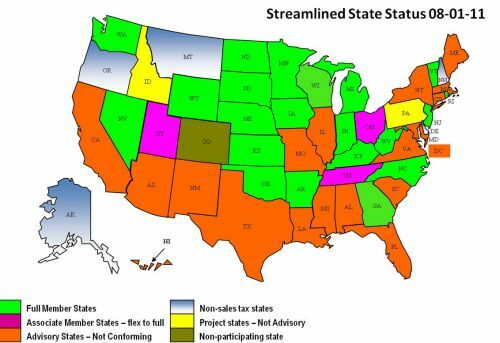 There are 24 U.S. states that are now part of the Streamlined Sale Tax Use Agreement. The group's Governing Board hopes to devise a uniform tax policy. Sherry Hathaway, a senior tax policy analyst for the Tennessee Department of Revenue and head of the group in charge with coming up with new policy, says that there is consensual agreement among states that tax issues need to be clarified, discussed, and adopted. The map below shows current Streamlined State Status as of late 2011. Based on a recent survey, it seems that most of the 24 states are leaning toward charging consumers taxes based on the actual purchase price of their daily deal voucher and not on the retail value. Good news for bargain hunters! The two dozen states that have made themselves a part of the Streamlined Sales Tax Use Agreement say that new policy could be adopted as early as May of this year. I can ask the same question for Australia. With deal sites here and there, updates from other countries as US will definitely be an important factor.